Here you will find some information of the development of the Global2015 project. 2003, 2004: The idea as well as the first research started, covering reports on risk analysis, issues of global environment and development, etc. (and so on) Search for similar projects. Development of different criteria for a list of most urgent global challenges. Concepts for networking, reviewing, and gaining partners in politics and business were developed. 2005: First draft of global challenges survey presented to German sustainability activists (see draft 2005). Preparations and research for international fundraising. Project concept finished (including a brief version). Launching a preliminary version of the Global2015 website. 2006: Concepts developed for supporting activities, for monitoring of global challenges as well as for corporate design and a new layout of the website. Registration of an .eu domain shortly after their introduction. Revised and completed draft survey on global challenges published. 2007: Informal review of the survey draft, leading especially to a new structure and chart. 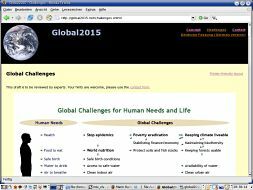 Global2015 website enlarged and completely redesigned. Research continued for an extended draft survey on global challenges, including separate, more detailed information on each challenge and a new illustrative chart. Preparations for the experts review process. 2008: Standard scheme for diagrams on all challenges developed. Concept for supporting activities revised. Informal review of the 2007 draft on global challenges. Extending and updating the draft, introducing a combined indicator on all challenges, a new list-like structure and diagrams on all challenges (2008 draft). 2009: Comprehensive research for updating and extending all challenge descriptions. Further development of the concept for supporting activities. Revising the scheme of the indicator diagrams on all challenges. 2010: Further research and extending the scheme of challenge descriptions. Founding an association under German law. First experts review of some topics. Revising the combined indicator. Providing a Special Edition of the survey for the UN MDG summit. Continuing with research on the detailed challenge descriptions.